The July 9, 2015 edition of The New York Review of Books ran a review by Tim Flannery. Flannery's review is titled, "How You Consist of Trillions of Tiny Machines." Pictured above is one of the "machines" he is talking about. "It is a bacteria-infecting virus, or phage. 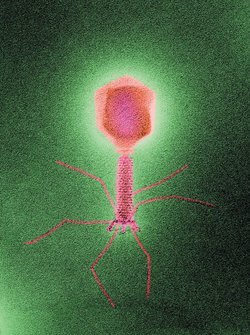 According to National Geographic, phages ‘are the most abundant life-form on the planet, their number far exceeding that of stars in the universe. Trillions inhabit each of us.’"
Flannery comments in his review on the following two books: Life’s Engines: How Microbes Made Earth Habitable , by Paul G. Falkowski, and A New History of Life: The Radical New Discoveries About the Origins and Evolution of Life on Earth , by Peter Ward and Joe Kirschvink. He calls these books "immensely rewarding." I have not read either of the books that Flannery has reviewed. His review, in fact, reinforces my inclination to rely on the review alone, rather than to read the books themselves, since Flannery says that "neither Life’s Engines nor A New History of Life is an easy book for the nonscientist." I definitely fall into that category. The review, though, which I have read, is extremely interesting, and I think it is pretty easy to understand, even for nonscientists like me. I recommend it. Ward and Kirschvink place the origin of life on Mars. Falkowski is not so sure about that, but the essence of the discussion in the "Trillions of Tiny Machines" review is not on the question "where" life came from. The review is focused, instead, on the discovery that our "large presence" in the world is in fact the result of work done by tiny, energy producing machines within our cells, which tiny machines have been able to get around the law of entropy. Falkowski argues that we can conceive of our world as a great, unitary electrical device, driven by the myriad tiny electric motors and the other electrochemical nanomachinery of cells. Viewing the world this way reveals hitherto unappreciated dangers in some modern science. Some molecular biologists are doing research on ways of inserting genes into microorganisms in order to create new kinds of life that have never previously existed. Others are busy working out whether the cellular nanomachinery itself might be improved. Falkowski recommends that rather than tinker with organisms that we can’t reverse engineer, a much better use of our intellectual abilities and technological capabilities would be to better understand how the core nanomachines evolved and how these machines spread across the planet to become the engines of life. Falkowski, in other words, suggests that we approach the World of Nature in an attitude of "wonder," rather than by immediately seeking to utilize our own powers to become the creators of new forms of life. That's a good approach, in my view. It is not only "precautionary," but it also recognizes the fundamental truth that we depend on the World of Nature, which has created us. Omitting to note this fact is, as Flannery says, "dangerous." If we will apply our creative powers within the human world, which in fact is subject to our dominion, we will achieve a lot better results than by trying to substitute in for whatever Creator or Creative Force found out how to put those "trillions of tiny machines" in motion. The only way to get out of the category "nonscientist" is to challenge yourself e.g. by reading harder science books. Understanding biology means letting go of unscientific ideas like a "Creator" or "Creative Force". These supernatural ideas only hinder understanding of evolution and the origin of life. 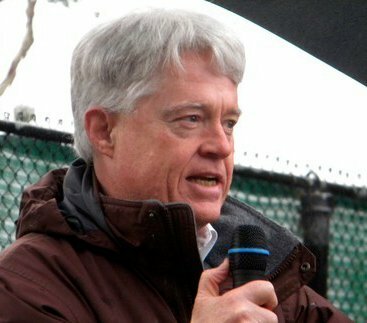 Falkowski's claim that we can't reverse-engineer organisms vague but clearly contradicted by the discovery of the genetic code and the field of genomics. He also argues from a false dichotomy. We can both "tinker with organisms" and better understand how these forms most beautiful and most wonderful have been, and are being, evolved.